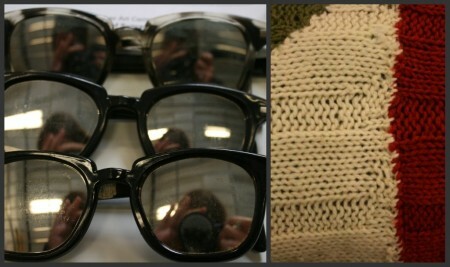 L: Sunglasses from Antic Meet (1958). R: Detail of the 4-armed, no-neck Antic Meet sweater that Merce knit himself. 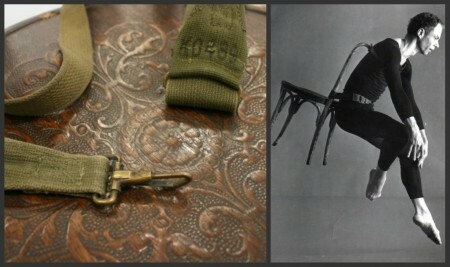 L: Detail from Merce's Antic Meet (1958) chair. 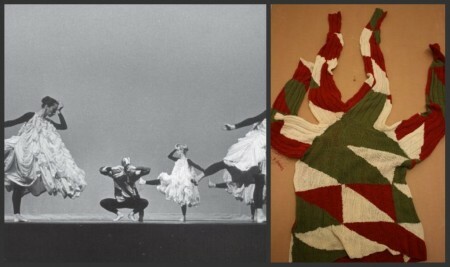 R: Merce Cunningham in Antic Meet (1958). Photo by Richard Rutledge. L: The under carriage of Merce's Antic Meet chair. 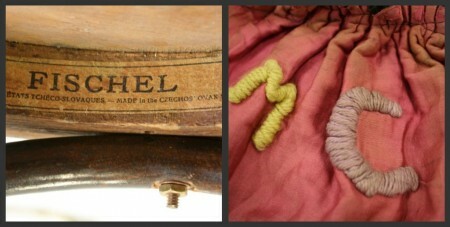 R: Merce's initials, sewn by Rauschenberg into Antic Meet's corduroy cape. R: MCDC in Antic Meet (1958). Photo by Matthew Wysocki. Note Merce in the background, wearing the notorious sweater. L: The 4-armed, no-neck sweater that Merce knit himself.